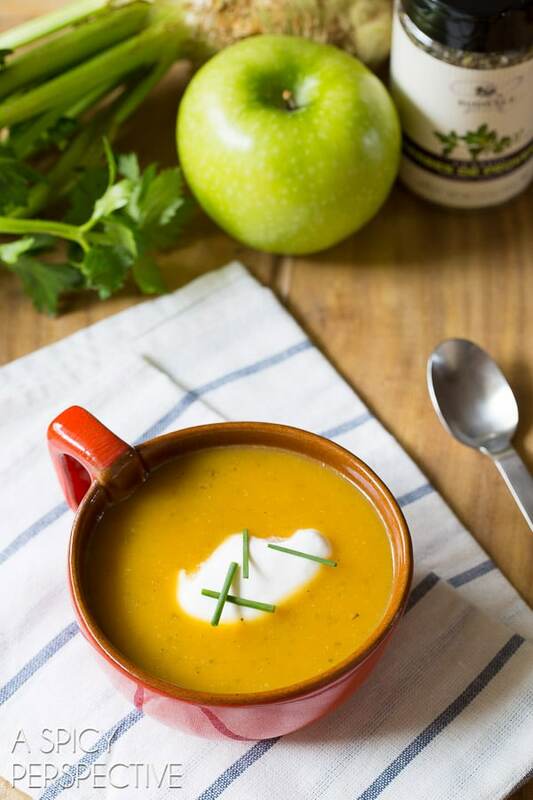 Healthy Butternut Squash Soup Recipe with Celery Root, Apples, and Herbes de Provence. This classic french combination is a treat on the dinner table and easy on the hips. We’ve has some of the coldest days of winter this week, here in western North Carolina. So fridged, my hands are cracking, even they’ve not been exposed to the elements. All I want to do is wrap up in a blanket, sit by the blazing fireplace, and read. All I want to eat is piping-hot soup… Like our Butternut Squash Soup Recipe. This healthy butternut squash soup is savory-sweet, with a delicate herby note. 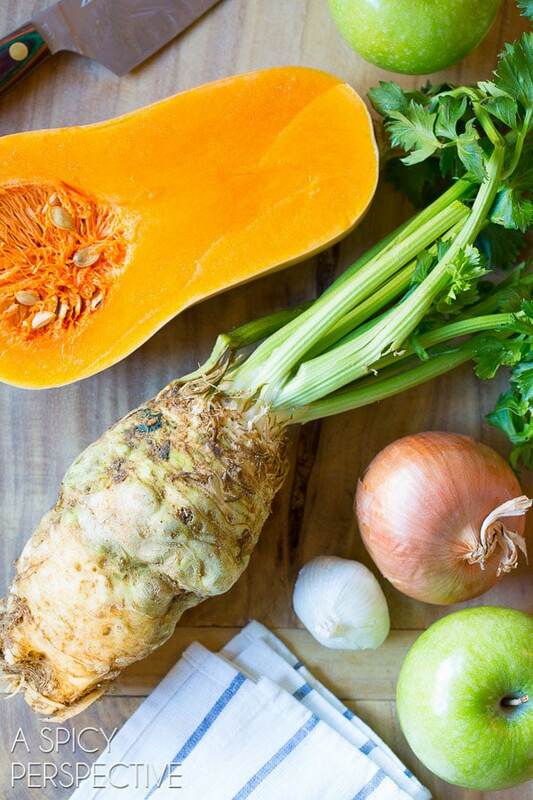 It’s loaded with hearty butternut squash, celery root, onions, and garlic; a classic french combination. 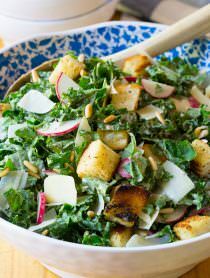 Then we added apples for a touch of sweetness, and fragrant Rodelle Herbes de Provence to round out the rustic french appeal. Herbes de Provence is an herb blend that incorporates all the flavors of a french countryside: rosemary, thyme, lavender, bay, basil, marjoram, along with a few other herbs. The lavender gives the herb blend a unique quality that makes plain-jane dishes stand out. 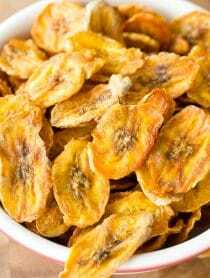 I made this slow cooker friendly recipe with my new favorite kitchen toy. It’s a cross between a slow cooker, an electric searing station, and a hot plate. Meaning, it’s an all-in-one must-have kitchen tool. Not really a toy at all! The new KitchenAid Multi-Cooker is a brilliant invention, making it possible to sear, simmer, and slow cook all in one easy-to-clean electric pot. It’s safe to leave for hours on its slow cooker setting, and eliminates the need to brown vegetables or meats in a separate pan before adding to the slow cooker. There’s an additional Stir Tower Attachment for the KitchenAid Multi-Cooker, to simplify dishes that you would normally babysit with a wooden spoon. Imagine not having to stand over risotto and continually stir. You just set the KitchenAid Stir Tower to your desired speed and time and let it do the work. In all honesty, at first I thought it was silly to have a device do the stirring. Yet now that I’ve tried it, I’m amazed at how hands-free dinner can be. Realistically, I could sear something in the morning, set the temperature and stir settings, and leave the house without care. And that’s exactly what I did with this healthy butternut squash soup recipe. I seared the veggies and apples to soften and release their flavors, stirring with the stir tower… while I did homework with the kids. Then I came back later, added vegetable broth and Rodelle Herbes de Provence, and set it to simmer for a couple hours while I worked out and visited with a neighbor. When we were ready to eat, I used an immersion blender to puree the soup until smooth, creating a ultra healthy plant-based dinner that filled and warmed our bellies. Today I’m giving away an awesome KitchenAid Multicooker and Stir Tower (worth $350) along with three of my favorite Rodelle Spice Blends: Herbes de Provence, Texas Style Brisket Rub, and Sriracha Seasoning. To Enter: Follow to prompts in the automated entry form below. For US residents only. 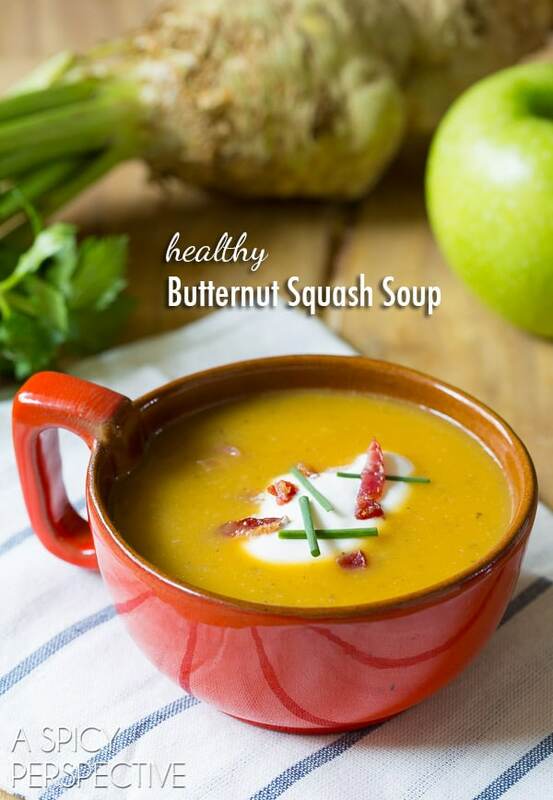 Healthy Butternut Squash Soup Recipe with Celery Root, Apple, and Herbes de Provence! This classic french soup is easy on the waistline. Turn the KitchenAid Multi-Cooker on Sear. Add the oil and once the Multi-Cooker is preheated, add the onion, butternut squash, apples, celery roots and garlic. Sear and stir (by hand or with the KitchenAid Multicooker Stir Tower) until soft and slightly brown, about 15 minutes. Then add the vegetable broth until it reaches the max fill line. Stir in the herbes de provence, 1 1/2 teaspoons salt, and 1/2 teaspoon pepper. Cover the Multicooker and set to Simmer. Set the timer for 2 hours and leave alone. Once the timer goes off, use a KitchenAid Immersion Blender to puree the soup until smooth. Salt and Pepper to taste. Best Garnish Options: Sour Cream, Creme Fraiche, Chive, Crumbled Bacon, Pomegranate Arils, Shaved Roasted Brussels Sprouts. Disclosure: This giveaway is provided by KitchenAid and Rodelle Spices. All opinions are my own. This might seem funny but never tried anything out of squash! And this definitely seems to be a great way to start off! Definitely trying this out! Something to stir risotto for me? Way cool. I would be making lots of risotto! I think I would have to try risotto finally. I have always wanted to but am too lazy to stand there and stir for so long! I want to make Cilantro soup! I would LOVE to make some risotto with this! On an unrelated note– I love your back splash! And the coolest KitchenAid product EVER! That is an amazing gadget! Some kind of vegetable beef stew would be good to try it with. Sear the beef, add the soup, and mix it up hands-free! With the temperatures dropping again, I would make a staple meal that my family loves – SOUP! I’d love to make some oatmeal raisin cookies. Definitely a chowder – clam or fish. Yum! I’d probably make some kind of soup. I would make my own original feta, garlic, tomato, dill soup. Soup, I would for sure make soup. Maybe something like a nice cauliflower or cream of mushroom or something. It is cold outside today, I would make soup. Our new favorite food….chicken curry! This seems awesome. French onion soup sounds good. I think this would be great to make curries too. I would love to make an array of soups… pumpkin, chili, italian wedding, and more! I would use this KitchenAid and these spices to make a Spicy Beef Stew! I have not idea. So many choices! A stew sounds like it might be a good inaugural dish, though. I would make a roasted pork in the slow cooker. Gosh, I honestly don’t know what I’d make. I’ve never been much for soups and such, in large part because it always seemed like a lot of work! Perhaps I’d finally try french onion soup at home! I would make some soup! A hearty soup or a big batch of chili for this cold winter. I’m in Canada, so I need all the warming up I can get! Obviously this butternut squash soup! But, I’ve had a recipe for a vegetable soup that I’ve been dying to try out, so that would be in the line up, too! Yum! I’d make butternut squash risotto! I would love to make a smaller batch of pasta sauce/gravy with this cooker! Love the color and kitchen aid! i would love to try risotto in this!!!!!!!!!!!! how cool is that?! Sriracha Chicken Soup! This looks so cool!! We really love chili, so I would do a veggie version with dark chocolate. I’ve always wanted to try making risotto and this seems like the perfect way to do it. I would love to make my potato soup in this new kitchen aid cooker. It would be an awesome addition to my kitchen! I would make broccoli soup. Your butternut squash soup looks delish and so pretty. OK..I have my eye on this baby (machine) for a couple of months now. Ingenious..what took so long..no longer do we need to sear or brown..yah. With that said first recipe to be make with be southern pot roast with potato, onion, mushrooms; and carrots. I would love to make this soup! This is awesome! 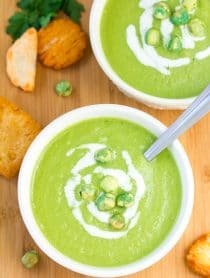 I would make some broccoli cheese soup and that butternut squash soup look amazing! I have never heard of this device before, but wow – it looks amazing! I would try butternut squash soup, chicken soup, tomato soup – my favorites. Then I’d get bold and open a cookbook or some pinterest boards and try a bunch of new things. I would try this squash soup for sure, looks delicious. I would make pecan pralines! I would make chili and all different kinds of soup! I would make this soup recipe you posted! I love butternut squash soup! This healthy butternut squash would definetly be my first recipe to try out with the new KitchenAid product. I would definitely try a beef stew. This sounds delicious. I’d make a slow-cooker Southwest Chicken with black beans veggies, and rice. I think I’ll be making asparagus cream soup. Sooo good! That is brilliant. ..would love to try making so many things! ! I would make rice pudding. This butternut squash soup looks delicious, I also love making and eating carrot ginger and good old chicken soup. I would love to make a chicken pot pie or slow cooker short ribs! So love butternut squash anything! This cooker is exactly what I’ve been waiting for. It’s perfect for my goulash, bolognese sauce, so many soups and dinners that I’ve been making in my crockpot! OMG the Stir-tower is genius! Would love to make a some sort of spicy soup! thanks for the chance to win your wonderful giveaway. I just found your website when I was looking for buffalo chicken macaroni and cheese … SO glad I did as the recipe was delicious, creamy, full of flavor and spice. It’s a keeper. I think I would try the butternut squash soup if I won. I would make a batch of Spicy Apple Butter! A creamy soup sounds good to me. I would make linguine with slow cooker beef and vegetable ragu sauce. I’d cook that beautiful Healthy Squash Soup. Looks wonderful. Thanks for the giveaway opportunity. I would love to try a Thai soup or classic chicken noodle. I would love to make Taco Soup in it or Chili, my top favorites. Soups. All day, every day! I would make a soup or chili. I have a lemon fennel risotto recipe that’s a pain to stand and stir…this would be perfect! I would make some creamy buffalo chicken chili. I would make mulligatawny soup! I would try your squash soup recipe. It looks so good! I would make any soup with that handy little cookpot! I would make minestrone soup! Yum! I would make a good chicken stew. this looks like a wonderful addition to my kitchen.. I love slow cooking and would use it first to make a minestrone soup…. Risotto! And yoghurt! And sound galore, including butternut! I would love to make this soup! Butternut squash anything is amazing! This looks incredible – the multicooker is pretty neat too. Thanks much for the chance! If I were to get one of these, I would have to try a risotto first, then maybe a carbonnade. I would love to try and make short ribs in this . Love the soup recipe…must try it this week. Would love to win!!! I’d love to make soups to start with, but this looks really cool. I think the possibilities are endless. I’d love to make a brisket in this using the brisket rub. If I won this appliance, the first soup I would make would be Moroccan Spiced Chickpea Soup. i hadnt seen this gadget until now. Wow!! It would definitely come in handy for all sorts of things… starting with my Mom’s homemade chocolate pie filling!!!! Looks super yummy – can’t wait to try this recipe! I love Kitchenaid! I would make everything! This butternut squash soup sounds like what we’ve been looking for to make. The multi-cooker would also be a bonus to use in making this soup! I would make our family’s favorite and that is a beef ot roast. It would be wonderful to win this wonderful giveaway. This looks awesome! Both the soup and the KitchenAid! Curried carrot soup my new favorite! I have a couple of soup recipes pinned that would be perfect to cook in this! I’ve never seen a KitchenAid Multi Cooker before, but it looks amazing! I would love to make a nice pot of chili to get warm! I’d make a split pea and ham soup! Awesome for Risotto! I would also make your soup! I have a recipe for Yellow Split Pea Soup with Crispy Prosciutto that would be phenomenal! Looks great for any soup! I never knew this device existed. It looks so neat and convenient. ANYTHING!!!! I just want to get my hands on this and make something! We love soups, so I can think of many to try! My instant reaction is French Onion Soup … but the list is endless! I would make a coconut curry soup! What a great kitchen tool! This would be perfect for our crazy nights when my kids have extra homework. I would definitely try this Butternut squash soup recipe. I think a chili with the Sriracha seasoning would be great, too. What a fantastic appliance!!! Cheeseburger soup would never be the same. What a cool gadget!! Thanks for this opportunity! 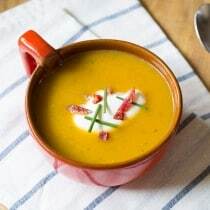 I love soupd, and this butternut squash soup would definitely be one I’d try..probably some pea soup & veggie soups, also.Yum!! Any kind of soup with that Sriracha seasoning would be awesome! I would love to try your butternut squash soup! Tomato soup first, then chicken and dumplings! I would make tomato basil soup in it. Love this! It would be a lifesaver for risotto! I would like to try chicken and dumplings. I’d make a yummy beef stew or a roast! I would make soup of some sort. This one or one of my favorites. This soup looks amazing!! Would love to make it! I would make my mom’s famous broccoli soup! I woul love to make a seafood chowder or bisque. A spicy tomato bisque, to warm up on a cold day. I would make risotto and then roast…always in a hurry to get it in so we don’t often sear it first! I think I’d like to try a pot roast, which I would sear before slow cooking and which would probably taste great with the Texas Style Brisket Rub. I will make sweetpotato soup! I would use the multi cooker to try this soup and several others! I’m going to research this new toy! It won’t be long before its time to get out in the creek and find some she crabs. I think this pot and that stirring gadget would make a fine she crab soup. I would make a beef stew! I would love to make a roast with potatoes and veggies. All kinds of summer jams and preserves!! I’d love to try a risotto I don’t have to stand over and stir. I would definitely make this soup! But I would love to experiment with this cooker. What a fun tool! I would be so excited to make a variety of different cream soups and broth soups!! So many options!! I’d love to make some kind of roast. I think not having to lose all that goodness from the searing pan would just amp up the flavor big time! What a fun giveaway! I would make risotto in it! :D So convenience. I would like to make a creamy sweet potato soup. First would be your butternut squash soup, and then anything and everything!!! This soup looks incredible! And I am in LOVE with that multi cooker!!! I wants it! I would really love to try this new cooker! I’ve never heard of such a gadget! I’m already subscribed to ASP. Do I need to resubscribe to get those points? French Onion Soup or Chicken Tortilla Soup! Two family favorites! I’d like to try a shredded beef. I’d make some sort of broccoli soup – mine always sticks to the bottom so it would be great to have the stirring attachment! Your Butternut soup looks amazing and happens to be my favorite soup but I think this cuisinart cooker may be amazing for making jam! The stirring feature is so great. I love my strawberry rhubarb jam but I hate stirring so this would be amazing to try. of course I would have to make scones to go with! Love to try it!!! I would like to try this soup and also split pea soup. I would make some black bean soup. I would make Risotto! Yummy! Some hearty stew for sure ! I did not see any disclosures at the top and was wondering if this is a sponsored giveaway by Kitchen Aid ?? Thank you ! I would love to do a carrot ginger soup in this!! I’d like to make a chicken tortilla soup. I’d first make a creamy Sriracha chicken soup. I love Butternut Squash Soup! It’s only been recently, that I started preparing it, the first time was this past Christmas! Your recipe looks like a real winner; the addition of apple sounds very appetizing! If I’m fortunate enough to win this KitchenAid Multi-Cooker and Stir Tower + 3 Rodelle Spice Blends, I would definitely make this Healthy Butternut Squash Soup! Thanks for the chance! I love soup and this is one I’d really like to make. I’m crazy about both butternut squash and celery root, but unfortunately it’s hard to get celery root where I live – I have to travel to the next largest city to find it. I noticed that the one you used was long and thin – I’ve only seen the fat, round ones. I would make minestrone soup, or goulash. I would love to make a pot roast or short ribs! I’d make this soup! Love squash! Looks delicious, added bonus for the giveaway! I would love to make homemade classic chicken noodle soup and stews. I think I would make some kind of creamy tomato basil soup. Thanks for the giveaway! I’m just now learning of this cooker and now want one! The butternut squash soup is what intrigued me! Shredded Chicken for sandwiches, Fajita chicken, sloppy joes, beef stew. I would love to make chili before winter ends! For this cold weather, I would make a carne en su jugo. Sooo delicious. I would make yummy tomato soup! I’d love to make my Drunken pork loin or pork roast– slowly cooked in white wine and loads of flavorful Rodelle spices — and winter veggies. But the stir tower of the KitchenAid Multi-Cooker is such a treat I’d most definitely use it for a soup recipe– like Sommer’s wonderful butternut squash one! So that makes two recipes right off the bat. Can’t wait. This is beautiful. I would make some chili. I’d love to make jambalaya! Thank you for the chance to win! What a cool tool! I hadn’t seen this new piece of KitchenAid brilliance yet. Even though we’re having the strangest winter (it’s going to be 60 degrees here today! ), I still crave soup everyday. And this one looks so good! Ok, this multicooker looks amazing. I would have to make a cassoulet or something similar (would be my first time) or a brisket for my in laws! I would like to make a nice and hearty beef stew with this. I’m sure my family would love it. Just about the time the fellow delivers this package it will be time to get out in the creek and round up some She Crabs for soup. This would be the most elegant way to cook a traditional Lowcountry favorite. On the other hand if you have a gadget to stir the pot for you doesn’t that make standing to the warm stove on a chilly day and swapping stories with your friends a bit awkward? I would make roasted vegetables with a whole chicken. I would love to try cooking some very versatile Indian dishes, like dal makhani, langarwali dal and ofcourse our very own version of soup, the ‘Shorba’. Since I love to cook and do cook most world cuisine, I would try out the Mexican chilli, soups (I am a big fan of soups!) and risotto! I would love to make a mushroom risotto like the one I made years ago for my husband on Valentine’s Day. Thanks for an awesome giveaway and a delicious-looking recipe! I would like to make my faux “potato” soup…with radishes, celery, onion, carrots, and cabbage!!! I would like to make short ribs. I would make this soup and brisket! it’s snowing here in MA (again) and it’s the perfect weather for some chicken noodle soup. that’s what i would make! I would make some vegetarian chili. I’d like to make hearty bean soup! I would love to make some ribs in this with the added Sriracha Seasoning to it. YUM! In keeping with my resolution of trying out at least 2 new recipes per month, I would have to try out Pollo En Fricase in the KitchenAid Multi-Cooker. Soup! Yum I love butternut soup! The soup you posted. Thanks for the recipe! Woah, I NEED one of these in my life! I would love to make some risotto with this bad boy, that’s for sure! This looks so great! It really has been cold here in NC, but I think there is still more to come! I would make a delicious and creamy potato soup. I have been wanting brisket. This would be perfect since I don’t want to smoke it outside. I would like to make organic fire roasted tomato soup. I’d definitely make some chicken soup with how I am feeling right now. I would make a soup. 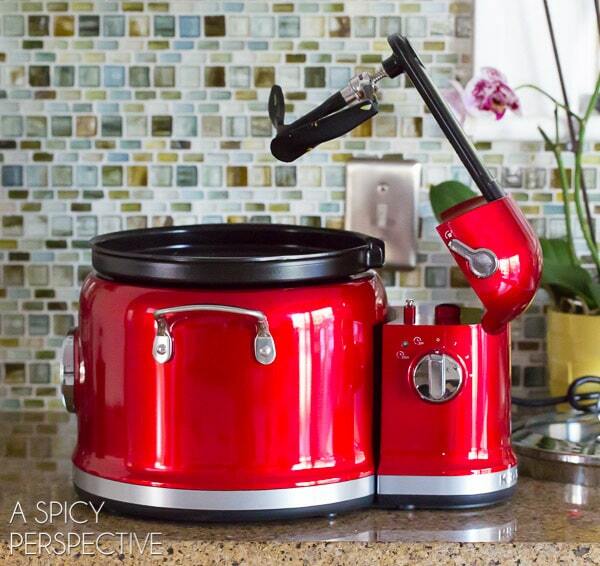 Ooo, that multi-cooker looks fabulous, I’d love to make a big batch of spicy tomato soup with herbes de provence. I’d start with this soup! It looks great!! I’d love to try the sriracha seasoning, probably on some chicken! oh my, yum yum! I would like to make PHO! I would love to purchase Kitchen Aid Multi cooker can’ find where I can ! The multi-cooker is awesome! I can think of a ton of recipes I’d like to try in this, starting with this soup! This soup is delicious! The multi-cooker looks really handy! homemade spaghetti sauce with meatballs. I’m still trying to get over the fact that there’s such a thing as a stir tower. How did I not know this? How have I lived this long without one?! And now I want to make risotto and cream of tomato soup. I’d love to make a seared chicken and rice! This looks amazing! I would try this soup! Not heard of a multi cooker before so I would love to try something new in one! Great looking soup! If only I could have a bowl of it for dinner tonight! some sort of chili, for sure! Ohh. We still have squash from the summer garden and I always love a new squash recipe! Thanks! I would love to make a winter vegetable risotto with this! How fun! We love butternut squash soup! I would like to make roasted red pepper and tomato soup with it! I’d love to make a chicken tortilla soup! Either bison sweet potato stew or short ribs! I would make your recipe first and then probably beef stew a few days later. Your recipe, sounds absolutely divine!! Beef stew would be my first choice. I’d love to make a chili as a first dish. wild rice chicken soup…from the stock up ! What a fun gadget! I think I’d go for a mushroom risotto for my first try. Thanks for the chance to win this cool cooker! I would make soups! This soup is perfect for a chilly winter day and perfect with a light salad for a full meal. I would make chicken soup. Herb debprovence goes well in pretty much everything! I love it here in your soup! I will make broccoli soup. I want to use the slow cooker and the spices to make a mean batch of slow cooked chili! I’m thinking some shredded beef sandwiches. I love butternut squash, I am definitely trying this recipe. I would make Cheesy Veggie Risotto! I have never heard of this cooker?! Cool!! love this soup! I’ve never heard of a multi-cooker. Oooh, sounds like a new kitchen gadget to check out. Love it! I would make this gorgeous soup with this awesome new “toy!” I neeeeed this! 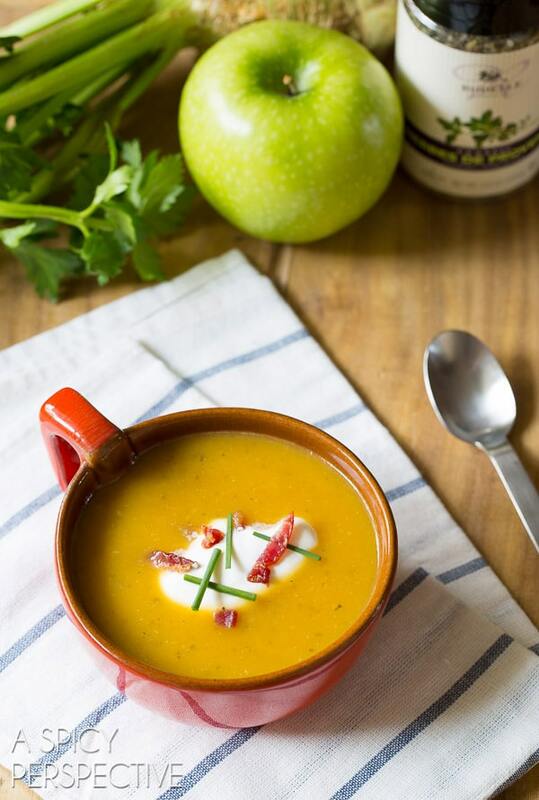 It’s dumping snow here today in Denver and this soup sounds like the perfect way to warm up! I’d make this wonderful looking soup that you just posted! This soup looks fabulous! Gonna cook it up later :) Fabo giveaway too! I would definitely make some braised short ribs! It is starting to get cold here again and this soup would be perfect for dinner to warm us all up. 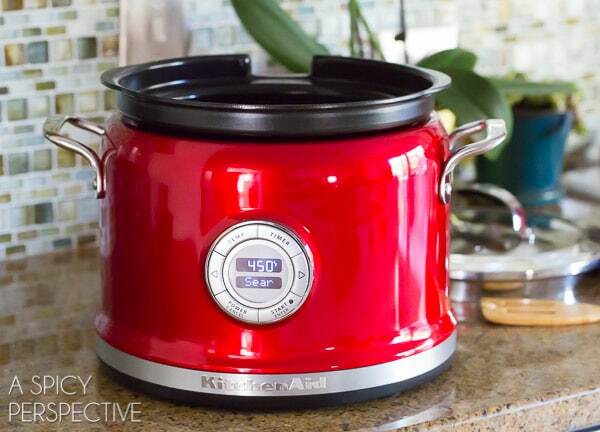 This KitchenAid multi-cooker sounds amazing. It would have been great yesterday while making split pea soup.